Today I have another Christmas card to share with you. It features some lovely Simon Says Stamp products from their latest release. I've been gravitating a lot towards Peace cards recently… such an important message to me at the moment. 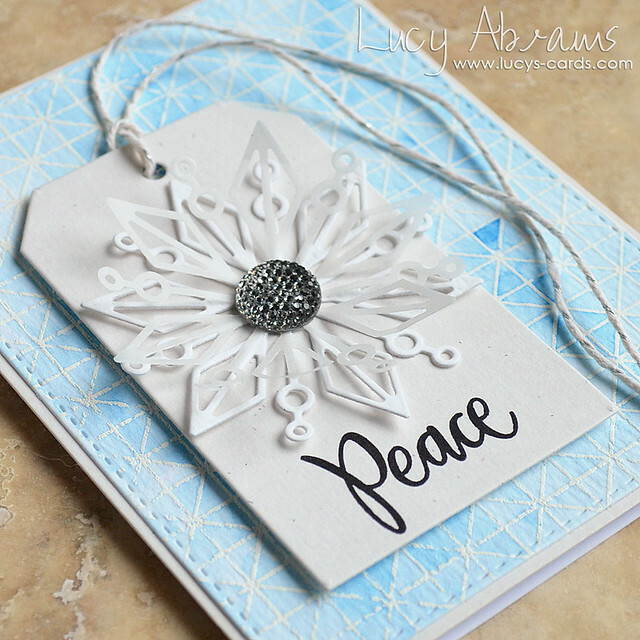 The beautiful Big Peace set has lots of possibilities… but here I chose to white emboss the outline message and colour in with watercolours. This aqua colour in the Gansai Tambi set is my favourite colour. Peaceful still waters… ice… gorgeous. I added a die cut 'Christmas', which I covered in Rock Candy glitter. Soft sparkle is perfect for this peaceful card. A splattering of shimmery watercolour paint adds a little more too. Some Mint cardstock created the perfect base for my die cut panel. 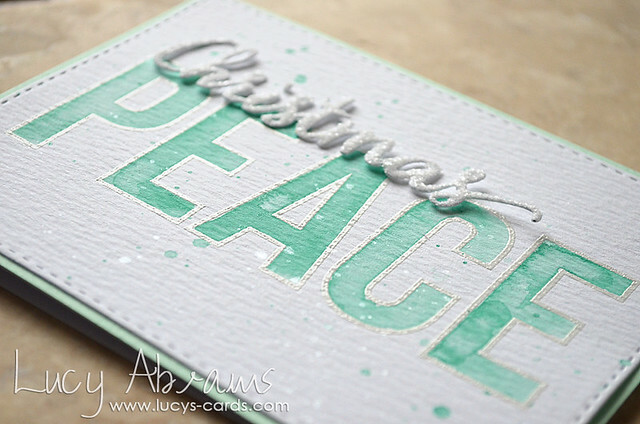 Today I have a card to share which features some lovely winter products from Simon Says Stamp. First up, that gorgeous background stamp - it's called Lattice Grid, and it's perfect for watercolouring. I simply white heat embossed it on watercolour paper then coloured with my Gansai Tambi watercolours. I die cut it with a stitched frame, then adhered to some rustic card. Next, the tag. I die cut a Large Tag from more rustic card, then stamped the lovely sentiment from the Big Scripty Greetings set onto the bottom. 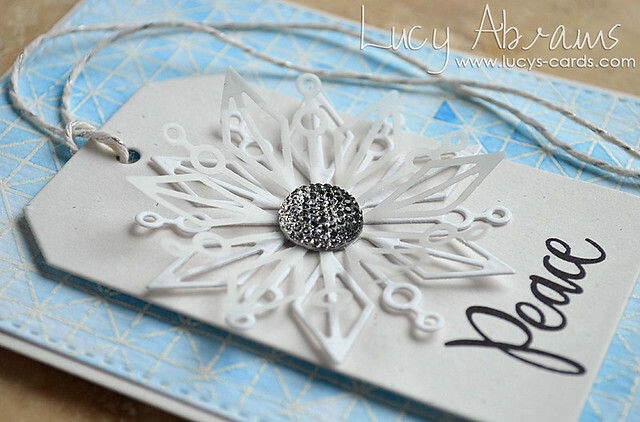 I thought the triangular patterns of the Nadine Snowflake went really well with the background stamp, so die cut one from white card and one from vellum. I layered them up, added a sparkly gemstone to the centre and added to my tag. Some yummy Lawn Fawn Sparkle Cord finished off the tag. I think this colour scheme works really well with the sentiment - blue and whites are certainly peaceful to me. And one more angle - the vellum curls naturally and adds so much dimension. And that gemstone - delicious!!! Thanks for visiting, and see you again soon. Today I have a card for you created with Simon Says Stamp's new Bear Necessities stamps and coordinating dies. I love the way you can create a cute bundled up bear, and initially I was going to make a new baby card… but this is what I ended up with. I used Cotton Candy cardstock and ink for my tone on tone heart snowsuit, added a sentiment from the Ready Set Snow set, and some snowflake sequins from my Snowdrift Shaker Selection. 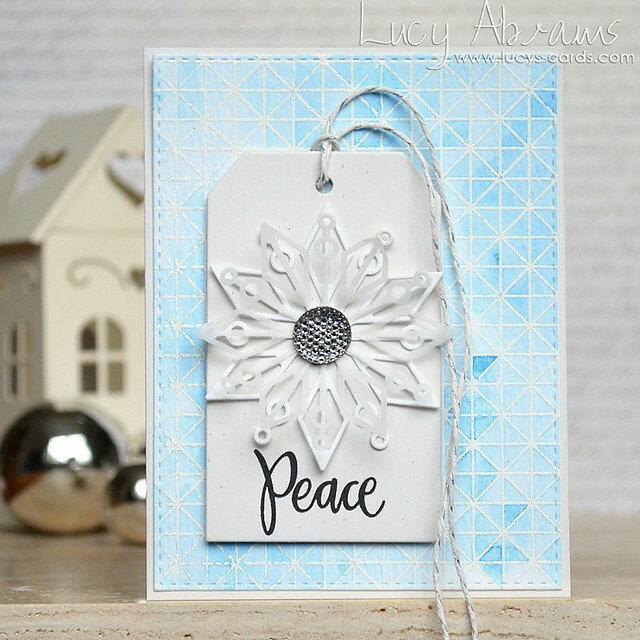 The snowy background was created with a mixture of white and shiny mist sprays splattered liberally on a white Stitched Rectangle die cut panel. It looks so pretty in the light. Hi, and a very happy Monday to you. Today I thought I'd pop in with a card I created with products from the November Card kit from Simon Says Stamp. This beautiful and delicate leaf stamp is from the Apple of My Pie stamp set in the kit. 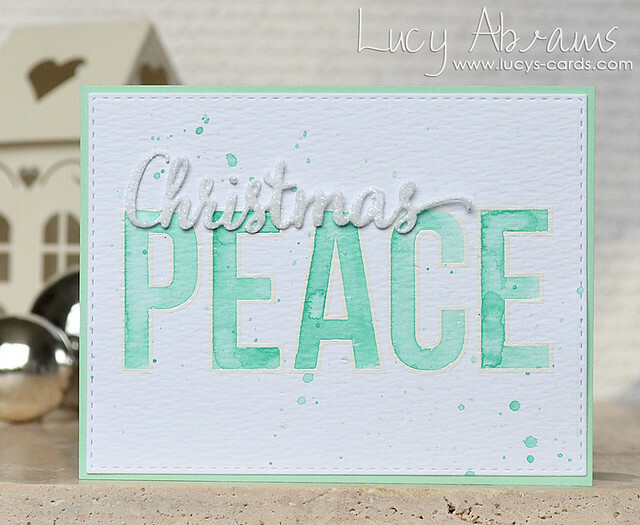 Here, I stamped it in Versamark onto some Sea Glass card from the kit, then aded white embossing powder and heat set. 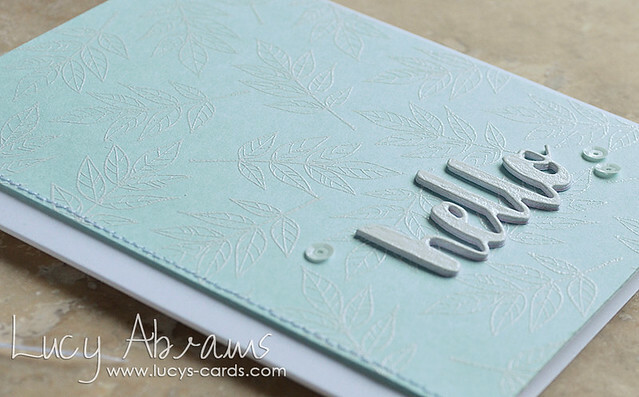 I die cut the Painted Hello (also available in last month's card kit) three times from white card. I adhered them together, then pressed into Versamark and heat embossed with white embossing powder to match the leaves. A little stitching and a few white sequins completed the card. 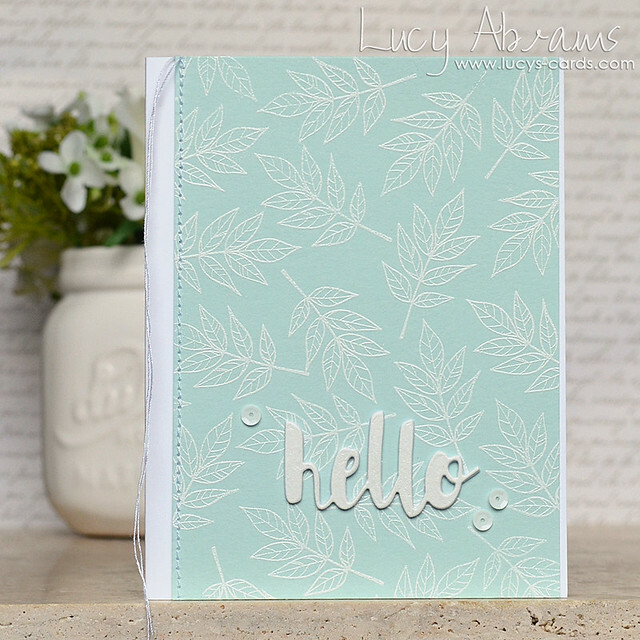 Adding the same embossing powder to the die cut word and the leaves means they match perfectly. OK - thanks so much for visiting. Before I go, I just wanted to say a HUGE thank you to all my amazing readers for all your kind comments. And to all my Little Things customers. I cannot thank you all enough for your support.